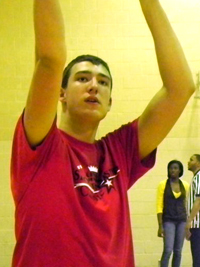 Evaluation: True back to the basket big man with great coordination and running ability. Can get up and down the floor and jump well for his size while still having the bulk to bully defenders and dominate the boards. Intimidating shot-blocker who knows when to go after shots and changes a lot of attempts in the lane. Offensively is developing still but has a good grasp for basic footwork and a natural soft touch. Go to move right now is his right handed hook shot which he can make consistently. Shows an above average stroke from the line with good rotation on his ball. Bottom Line: Morgan has high major potential with his size and mobility. He needs to continue to get tougher inside and work on developing counter moves to his right hand hook shot but he has a lot of upside still. Notes: Committed to Illinois in June of 2012.